We work with LED manufacturers on special project, so we have our eye on LEDs for UV and cannabis. For some things, LEDs are definitely the way to go, however, at this time and for the foreseeable future, LEDs are not going to be effective for stressing cannabis plants. We have a few decades of experience behind us, so trust me when I say, we will be the first to offer them when they are viable. 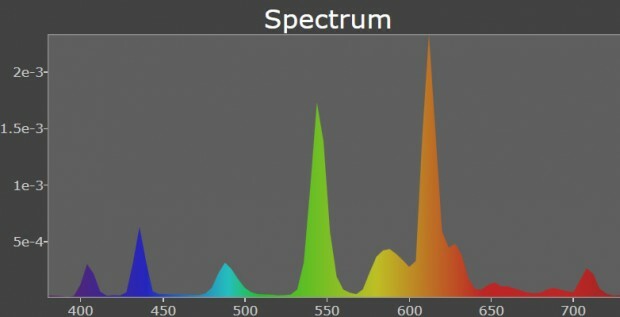 Above is an example of what he spectrum looks like when you use LEDs. It is very spiky. Each spike is a different LED, so if you are only using a single type of LED, you only get one spike. For some applications, this is what you want, but for growing, it is not. At least not when it comes to UVB. 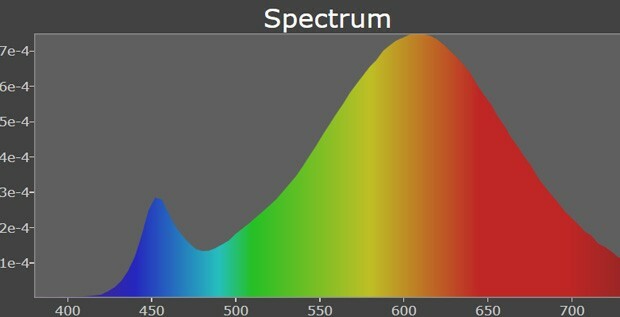 Above here is a typical spectrum you would see from other types of lighting: incandescent, fluorescent or the sun. It is a smoother and more natural spectrum that contains more frequencies. This is what plants are used to. This is particularly important when it comes to UVB. Solacure lamps not only have a smoother spectrum, but our Flower Power lamps have a more complete spectrum since they can reproduce the lower half of the UVB spectrum, something that ordinary lamps can't do. This is why we have licensed patents, to be able to produce this fuller, more sunlike spectrum, then make it more intense. It is true that any UVB source is better than none, but the ultimate source is one that spans the entire UVB spectrum, and is strong enough that you can actually give the plants MORE ultraviolet than they would get outside. Or less if you want. You control it with the timer; it's that simple. What makes it simple is starting with an extraordinarily strong lamp that produces the right frequencies, and the Flower Power certainly lives up to expectations in this respect. What we have tried to do is create a product that is very affordable for what it does, lasts at least two growing seasons, is easy to maintain and work with, and only needs a simple timer to operate. You use two lamps per 1000w hood (or equivalent) so you are adding 80w of UV for every 1000w of general lighting.